Peggy's suit is definitely one of the most distinctive pieces, and no, it isn't just a blue suit off the rack, sadly. 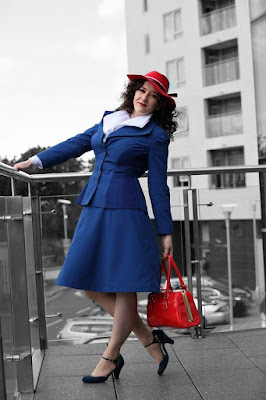 It is clearly modeled on 1940s styled suits, with a longer length to the jacket and the A-line skirt. Finding a reasonable pattern for this turned out to be quite easy. I used the Simplicity 3688 pattern as a base as it was already 40's in style. Although the piecing of the jacket was wrong, it gave me a good basis to start from. Don't get me wrong, if you're looking for a reasonable pattern this is actually quite a good basis to start from, but the suit I wore is certainly not a direct copy from the Simplicity 3688 pattern. The silhouette lines are right, and the pattern is easy to follow and if there's a better one out there to base a 40's outfit on that isn't from the time period, I haven't found it. But there were things that just weren't quite identical to Peggy. 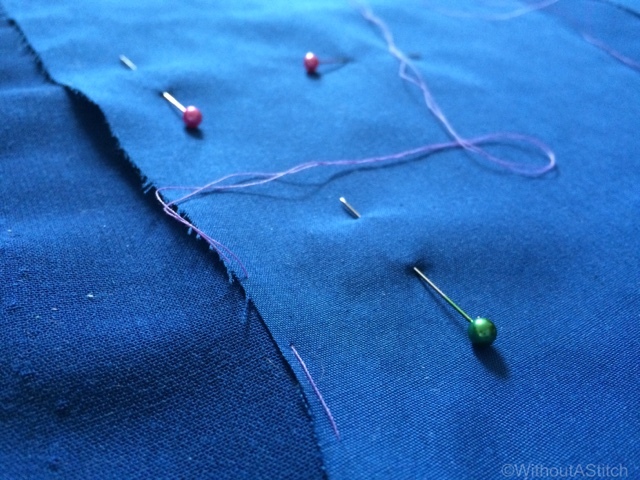 One of the more difficult parts to get right for Peggy's suit is that it is not just one colour. A lot of cosplays out there just use a blue suit, and that's fine, but wasn't fine enough for me. You can see the different colours in the photos, and the designer talks about it in an interview, so I knew I wanted to make sure to have that detail in there. 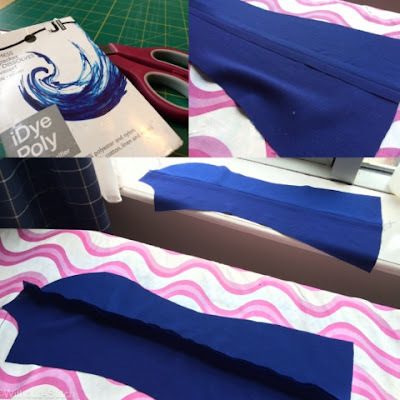 I had found a perfect blue rayon crepe for the suit/skirt, but finding additional blues that worked turned out to be a huge hassle (see previous posts on how dire Dublin's fabric selection is), so I settled on dying for my extra color. To get the three colours in the jacket, I first had to find a polyester dye as none of the local shops had any. I did both colours in the same dye bath, just leaving half the fabric in twice as long as the other. The difference between the two secondary colours is not drastic, but I was happy it worked out at all. They probably used different fabrics in the show, but that just wasn't happening for me, so dye it was. Actually, I'm pretty happy with these results and it meant I had the same hand in the fabric, so it all came together nicely. The jacket needed a lot more alterations than the skirt. The piecing had to be changed, the flare of the collar was wrong and needed broadening, and I had to get in the spaces for the three different colours. Jacket bodice from patterning to lined. 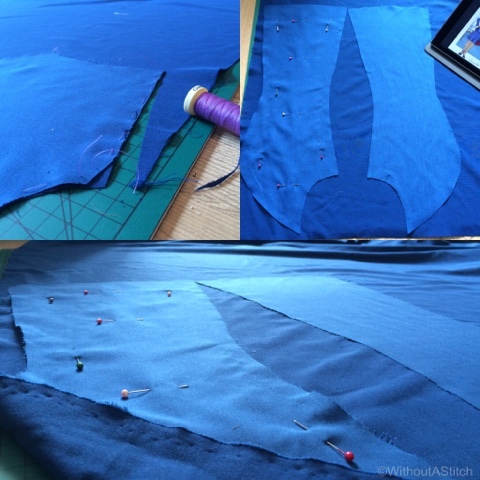 Queue a lot of me cutting, sewing, drawing lines on myself, re-patterning, and repeat. I made the mockup, changed the lines, made a new mockup, change the lines again, and eventually got a pattern. 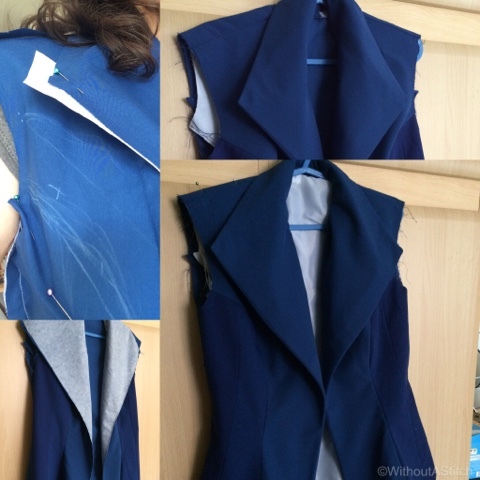 I think I ended up sewing the jacket together 5 times in various versions of mockups before I was happy with the seam lines, collar, and silhouette. Fortunately, I didn't do this in the fashion fabric until I had the pattern right or else there would have been tears. Various process shots working towards the underlining. Then it was mostly a matter of construction. I also went to the trouble of underlining the jacket. This gives the jacket a lot more structure than if I'd just used the fashion fabric. It ended up being a lot of painstaking hand sewing, but it was definitely worth it when you feel the heft and weight of the jacket. It also sits better with the extra fabrics in it and I could attach the interfacing to the underlining instead of the crepe, which meant it kept its beautiful look. The skirt pattern was close enough that I just went with it. In theory, the top of the skirt could be altered a bit to be more accurate, but its not going to be seen much, if any, so I left it. I did change it from the pattern in that I used an invisible zip instead of a normal zip plus button. As far as I can tell, the invisible zip is what's used in the original. Adding horsehair braid to the skirt. 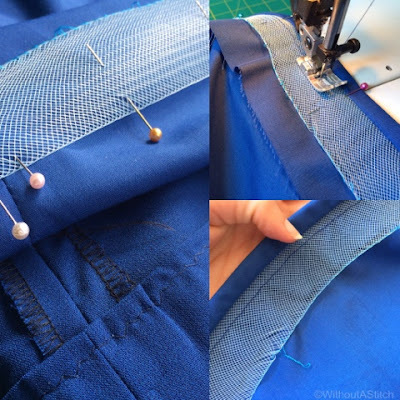 I chose not to underline the skirt, as I loved the hand of the fabric and wanted its swish, but I did give it a lining so there was no chance of it being see-through. The one thing I did do differently was add in horsehair braid on the lining of the skirt. I thought about putting it on the fashion fabric and decided against it, which I think was the right call. This way the lining acts as a mini-petticoat and gave the skirt a much fuller and poofier end than otherwise. In the end I made a shirt for Peggy as well. I'm really glad I did as the store-bought shirt I had for her just didn't have the same lines and wouldn't have looked nearly as amazing. I did end up using the Simplicity 3688 pattern shirt sleeves, which are perfect for that 40's look, but I free-handed the rest of the pattern to try to get something approximating what you see in the shot. The shirt still needs some work, but it worked for the day. I might have been a tad excited putting it on. Excuse the mess. Overall, I am so happy with how the suit/shirt combo came out. The silhouette that came out is just about perfect, especially with the flare the horsehair braid gave to the skirt which I really had put in as an afterthought. It balanced out the heavy shoulders with the bottom of the skirt and really gave it that vintage 40's vibe. Wearing Peggy was great. Like I said, she's amazing and kickass, and I couldn't help but walk with my head up and full of confidence. You can't really pull that hat off without it. I can't wait to wear her again, as she was just so much fun to run around it- and comfortable to boot! You looked amazing at CosplayCon, I tip my hat to your mad sewing skills! Great costume! Your attention to details is superb! I noticed you put the pale pink(?) trim around the collar edges on the blouse. How did you make the blouse ie what pattern/ fabric did you use? Thanks! Thanks, Jordan! 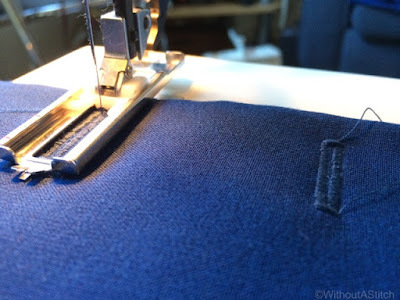 The trim around the shirt is actually just stitching. I found an interview with the designer who mentioned that was what they used. The shirt was mostly draped, but I have an upcoming blog post about it. I'll bump it to next week so it comes out sooner. Out of curiosity, do you ever make cosplays to sell? Cause the suit I ordered from Amazon got lost in the mail and the one you made looks absolutely gorgeous! Hi Dash, thanks for asking! Unfortunately I'm not in a position right now to take commissions. Even if I was, making this suit for others will be difficult if they are not able to having fittings for it. 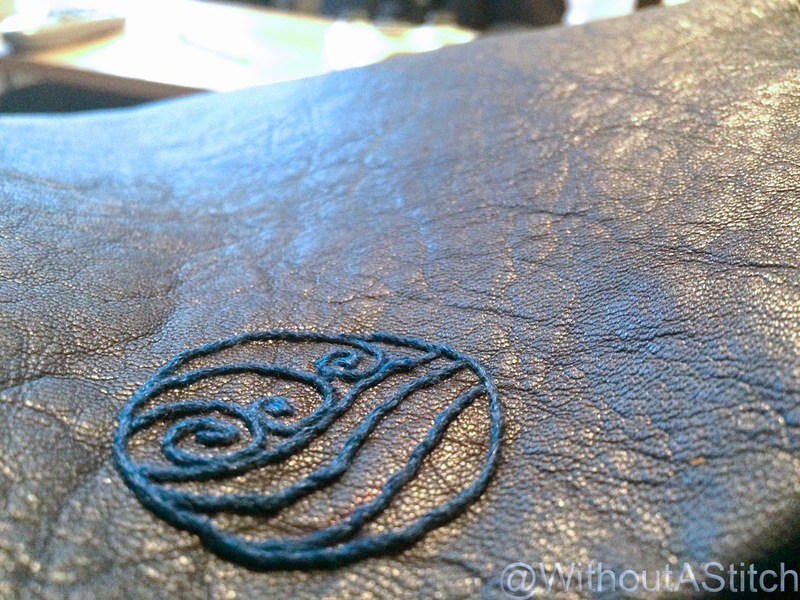 Also, the materials I used are not cheap because I wanted it to have an authentic look. I've done commissions before, but people usually balk at the pricetag. 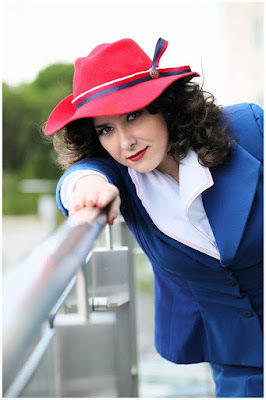 My materials alone for this costume (hat, shirt, & suit) were almost €200, and that's before you add in my time working on it which would at least double it. Most people aren't willing to pay that. TL,DR: No, I'm afraid not. I see that I'm late to the party here, this article is over a year old, but I wanted to tell you that I love the costume you've created. Thanks for the pattern number and the details on what you changed up. Hi there, sorry for the late reply - wedding, honeymoon, all that jazz. I'm glad you enjoy it and that the write up has helped someone else! Your suit looks great!!! Don't you just love Peggy Carter! She's ond of very few female characters that I can actually love and get behind. You look amazing! Well done on the uniform. I keep meaning to make one of her TFA outfits, but just haven't made it there yet.